Today i will write an article about philosophy of use, correct use, ergonomics and locking mechanisms. It may sound strange but I can assure it is important teachings. First is important that every tool should be practiced with and used if you are going to have confidence when you need a tool in an emergency. If you have learned to use a traditional 91mm or 85mm SAK then you have learned correct knife use. That said if you are looking for a knife for services or rescue tasks then you need a professional designated tool with locking mechanism. I will explain further what I mean. This philosophy is actually not any different for a normal person in the outdoors. Larger tools save time and they are made to be used for a bit harder tasks and this is the epitome of locking mechanisms. A professional person knows to have focus on the cutting tasks and he or she will know and remember the training or practice. With training you get an automatically reaction that is correct. It is very dangerous to incorporate into the training to rely on putting too much force against the lock. That is why it is important to learn correct knife use with the traditional SAKs without a lock. So why a lock then? There are two sides to this in any situation and one is the comfort and the other is when every second count. You do not have time to worry about correct knife use when you are tangled into a rope pulling you to the bottom of the sea. Then you need to have that practiced motion in an automatically mindset. If you need to “force-cut” a material very fast you need to have correct motion without worry about the edge getting stuck in the material backing out. I recommend into the training to learn to pull the blade out avoiding force against the lock. It is unavoidable that in many cutting situations that you cannot have a stable balance and you may or not be upside down or on the side or whatever. Upside down is not an experience most people know and it will be difficult to cut correct for most people. Ergonomics got everything to do with safety and locking mechanisms. I have noticed some are so occupied with cutting that they do not remember to have the correct pressure in the grip vs the pressure they apply on wood for example. The result of this will or may be a slip causing injury. It is important with a tool to have a good secure grip and this grip must be strong enough vs the force you use when cutting on a material. The knife should be clean, sharp and ready all the time. How you carry the tool is of a huge importance for safety. It is important to have in mind that you can reach it no matter what. Ergonomics is a signal between the grip and a signal for the amount of pressure you can apply during use without slipping. So why not use a fixed blade knife and my answer is that it could be smart to have both. The key with SAKs is obvious that you have a designated package with several functions. The advantage is also the carry that it can be in a short pouch. This got two sides and one is for an unexperienced person and the other is for a trained person. Accidental closing is general means when a knife blade accidental closes and you may or not cut yourself. For an unexperienced person using a traditional knife without a lock he could cut wrong or walk around and stumble. For a professional it is very different because he would understand correct use. If the unexperienced person has a locking mechanism he may rely on this and use it wrong. Then the locking mechanism will probably prevent an injury while the professional will use the knife correct and have a confidence that if a situation would happen he will have that extra safety with a lock. A professional person will use the knife as if there is no lock at all. The unexperienced person will not. Locking mechanism against accidental closing philosophy is not made to be able to take too much force against the lock. It will take a good amount of force anyway. Larger knives need to have locking mechanism because a larger blade will be used on more material and it would be impossible to make the slip-joint spring stronger than it is without destroying the comfortable functionality. The tension on the slip-joint spring is also very important to have in mind and many forget this completely when they get a lockable blade. The tension on the spring with pressure holds the blade in the out position enough for cutting tasks. Most cutting is when you use the blade at the correct angle applying force toward the edge and not opposite. The slip-joint spring holds the blade both ways, the design of the blade geometry and construction secures cutting performance without the lock. It is the spring that is the functionality on the 111mm knives as well. The locking mechanism is there as a backup. The small play against the lock is because of a slip-joint construction and probably unavoidable sometimes. That little play can be valuable when you use the knife during cutting to find and notice wrong use. This you can only learn from practice. One hand opening and ergonomics are important. The hand must have in the training a secure opening. The grip must be there so you do not slip the knife when you are using it. Knives for safety should have one hand opening and a locking mechanism. When you learn to use a knife then you will understand that balance and secure grip together with how you target the cut. If you swing the blade towards a rope it will or can go well, it can also just be pushed to the side for example. A combination edge will increase your chances on many materials and it may save time. Controlled cuts is the most important even when every seconds count. To target the cut with control will increase the chances and the performances. During an emergency many people get much stronger than normal and will put much more force on the edge. This is why a professional tool must be made stronger. It saves time and it can take more abuse. A knife with a locking mechanism is not a dumb knife. It is evolution! On the picture to the right you can see a symbolic philosophy of what areas of the edge that can be put the most force on. The ergonomics on SAKs can be used in a reversed grip as well. The OH lock blade on the picture is a perfectly designed “in general” for safety and rescue. The design of this tip is not for stabbing. 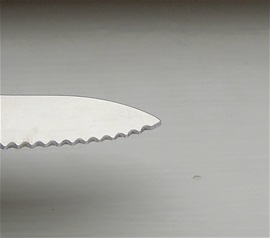 The design can be used for rescue tasks and this will incorporate the tip of the blade under a belt for example to free a person. This mean you must rely on a lock even if you try to avoid wrong use. The wavy edge will cut belts easy and the inner section can be used to force cut wood for example. The complete combination edge can also be used in a saw motion to cut extreme fabrics easy. When you apply force against the edge it is the slip-joint spring that rests against the tang of the blade and hold it in position. Then it is not the spring tension it is the design of it that hold or support. When you use the design of the blade for cutting yourself free from a belt then you must push the tip under the belt. Doing this it is unavoidable to push against the lock to some degree. If you use the part of the blade marked on the picture for support cutting such a belt then you may get a less grip. I recommend some practice. When every second count you should use the blade without thumb rests. Good cutting abilities on belts are either an inwards curve on the blade or a belly like on the 111 OH blades. This blade you find on the New Soldier and other OH 111mm liner locking Victorinox knives. It is absolutely impossible to get safety knives without locks that could be secure enough when every second count for either person. It is not so that the 111mm OH blade with combination edge got a round tip. It is not as pointy as the plain edge knives and there is almost flat edge on the outer section close to the tip. The grind of this edge got a pointy area that is under the tip so when you are going to puncture a device this can be used. The design of the blade and tip section is excellent for cutting belts and when you are tangled into something. 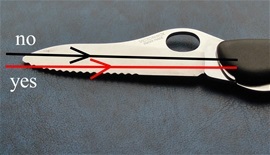 The curve on the back of the blade that got the hole for OH opening will also help when you free yourself from a belt. If you are stuck in a car seat belt and this is very tight toward the body then you must use the tip section of the blade to get under and cut. The design of the blade with wavy edge will destroy a car seat belt in seconds. The curve of the backside that holds the hole for OH will prevent the tip going into the body of the person. It will give leverage outwards when you bend. The 111mm OH blade is not for stabbing, that said it can do some stabbing if necessary. If you would get pressure in 100% correct angle then it is the rivet and slip joint spring that takes the impact without folding the blade or putting too much pressure on the lock. If you would stab into the ice to get out of the water if you fall through then use correct angle. It is actually better to grip the edge into the ice. On the picture you can see cutting angle on materials. The red line mark the absolute limit when you push the blade, except when you free yourself from belts. The black line marks what is usually a no with any folding knife. Because you have a lock then you can allow yourself to use the design to push under a belt with the edge away from the body. This will put some pressure against the lock like I have explained. Victorinox makes quality knives that you can rely on doing so. From martial arts i have learned valuable lessons. If you are facing an opponent what do you do? What can you do and what is the plan and what can you expect? I have learned a lot of different fighting over the years without any belts. My philosophy is mixed and I will not be surprised by great strength or size either. With knives for me it is absolutely not about fighting it is fully a tool that can be used for EDC or outdoors needs. The lessons from martial arts are there still and it is what can be used with tools and multi-tools. Today survival for most people does not involve survival in the wilderness at all but rather in areas with some population or cities. Most survival situations are there and not in the wilderness. The society is changing and knives and tools may be necessary because of environmental changes. You cannot bring a knife to a gunfight but you can use it to get away from a crash or situations without hurting anyone. You can use it to repair and do maintenance. Here you can see a link to my fast Ranger Videos . It is just symbolic made and both Victorinox and Wenger are very close to the same made Swiss Philosophy of use by them. I am humble in my interest and it is important that people start to wake up and be prepared and avoid dying at sea from trivial situations for example. The one hand opening on Victorinox and Wenger are considered slow opening systems. It is not about tricks or other that you manage to open secure, fast and controlled. It is important to practice. I have improved my speed by another 25% and this I keep for myself with a smile. Usually it is the controlled opening that is most important and too fast may become unsecure or a risk. The main design on this rescue blade was on the 108mm, then the 111mm. The next evolution was on the RescueTool that could be opened against the body. Today it got OH and lock! Today i will explain a few details on the slip-joint spring for the belt-cutter on the Fireman. I have noticed over the years that some ask about the raised spring. I have explained this a few times before. The rescue blade or belt-cutter got a raised spring when the blade is in open position. I will explain a few things I know and what I have experienced from the constant quality development and evolution. The individual springs on the SAK sandwich construction got individual abilities. Some are designed for more than one function. The springs are depending on if a blade got a locking mechanism or not. Some are designed so it can make stronger pressure to prevent accidental closing and some springs are more solid to be able to take force against the spring mechanism. Some are also made special in design so it can function as a support for the entire construction in a more advanced way than usual. A slip-joint spring is advanced and shall be able to be opened and closed for a lifetime of use. The tang and slip-joint springs are polished so you get precision, corrosion resistance and functionality with durability. Depending on where the spring and function is placed in the construction and for what use it may have alterations in design and shape. If you look on the RescueTool belt-cutter/rescue blade then you can see a more advanced design that got a greater functionality and safety. The spring is raised still. If you look on the more even more advanced and developed Rescue blades/gutting blade used on the Dual Pro, Hunter XT and more then you see the development. Depending on what category the springs will be stronger for the professional tools. A slip-joint spring designed for having a backup lock to prevent accidental closing may be different in design. It still will have the main purpose as a spring that will fulfill every aspect of use without the lock. The slip-joint spring may be used for more than one function. Because of a constant quality development you will find variations and evolution. In the Victorinox evolution you can see how the spring and tang design vs. each other got contact areas changing and develops. To prevent accidental closing on a traditional slip-joint spring you can make the pressure stronger or you can alter the angle in design. You can make additional additions to the tang construction to be able to function better against accidental closing. At some point depending on the length and size of the function and for what use then the locking mechanism to prevent accidental closing must enter at some point. The design can be perfected in the contact areas with the slip-joint spring so you can have the main philosophy of use that there is no lock at all. Still you know it is there and you get a higher confidence during use. It is unavoidable that a lock must be made at some point. 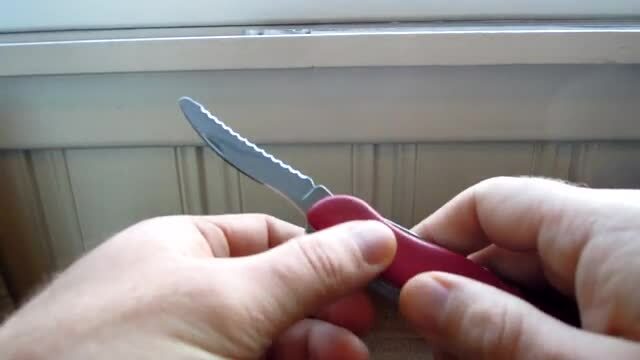 The Victorinox spring is in the elastic region and this means opening and closing all functions at the same time with damaging the construction. The spring is so advanced and it is a secret to the quality. A slip-joint spring must be strong enough to take the use it is intented for. Who made it first I do not know, I do know it would have to take archelogy and study the human history to find who made it first. Locks to prevent accidental closing have seen different applications outside just the knife blades. These types can be made with a liner that typically will prevent the blade or function to accidental close. Many times it is not a full contact lock until a small pressure against the blade will make it fully in contact with the locking liner. It is typically that such mechanisms are in combination with a slip-joint design. The spring will make the usual functionality and the locking liner will make sure it will not fold accidentally. This locking liner can typically contact more than one surface on the tang of the function when engaged. It can also during stress or force against it have flexibility so it can lock further. These mechanisms may in many times have design that makes sure the contact areas will not fall outside the tang and have a stop function on one side. It is important that the functionality to release it is sufficient comfortable. Typically the design of it must be so it will continue the ergonomics. One must not underestimate the strength of this mechanism because the function that is most prone for activating the lock is the flat screwdriver for example. Especially during hard twisting motion this lock will be active more often than the on a knife blade. It took some force for sure! Locks against accidental closing are "work mechanisms" for tools and functions. It is very different from mechanisms designed to be able to be used for stabbing. In my opinion it is the perfect example on the opposite. Accidental close lock designs are not a full contact mechanism. If you have a long screwdriver on a slip-joint design then you will automatically notice the need for a lock. If you have a long screwdriver like I mentioned you will or could damage the equipment or you hand easily. If the screwdriver is shorter you will still have the need for a lock when you use force. The slip-joint spring can be made with a strong pressure that will prevent it from sudden folding in. To be able to open it with the nail nick would not be comfortable anymore. This can cause damage to equipment and the person using it if it folds during use as well. It must therefore have a lock to this. Typically it is so that when a slip-joint is in combination with accidental closing preventers it is actually the spring that takes the hardest load at least on the knife blade. This is because correct use is about putting the edge against a surface and not putting pressure on the back of the blade. You use the knife as there is no lock at all. 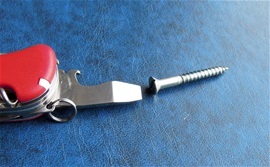 The Victorinox and Wenger slip-joint spring can take serious pressure against the slip-joint spring. Correct knife use is about have a sharp knife all the time and therefore you prevent using too much force.